The Economist's editorial in support of the union. Mikey Macintosh's assessment of the campaigns and alternative vision for the future - the best thing I have read from a Christian perspective and deserving of any thoughtful Christian's time. Phil Moore gives us a bit of history and three things to remember when praying for Scotland. For my own thoughts – well, where to start with something as large as a nation’s destiny and as small as nationalism? Much of what I’ve observed in this debate has frustrated me, as both sides have made poor arguments (Of course Scotland can exist by itself as a country - there are many much smaller and poorer which do. Of course Scotland cannot default on a shared burden of debt if it is ever to be taken seriously by the rest of the world and its bankers.) 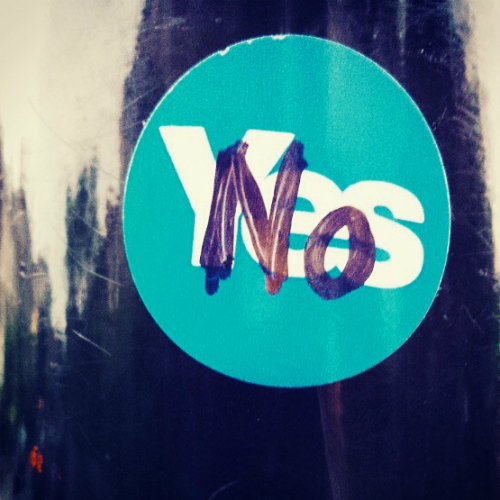 I think that the Yes campaign has often been deceitful, and Better Together has often missed the point by failing to explain what the union has been and can be in terms other than economics (Tom Holland does a good job of that). What has troubled me most is the divisiveness that the independence campaign has been built upon. The referendum gives Scots the opportunity to define themselves by division (however anachronistic they might want to declare the union to be). It’s ironic, from this perspective, that Yes campaigners present Scotland as diminished and limited by the union when in fact the opposite has been true. It is to Better Together’s discredit that they haven't told this story more effectively: that so much of what is great about Scotland has been revealed in and by the union, what Scotland has given and what it has received. I fear for anyone - and any nation - who cannot see that they need others. Humility and interdependence are marks of wisdom and greatness, and they are usually rejected by nationalism. On a personal level, independence for Scotland will force me to define myself incorrectly, should I need to describe my nationality. "British" will no longer be an answer. But like so many in these islands, I am a happy mongrel, my mixed blood hailing from Ireland, England, Scotland, Cornwall, and Lithuania. No single one of those terms is sufficient, whereas "British" contains a breadth of possibilities wider even than my needs. Not only does it have space for me, but there is room for many others whose stories are different to mine. This, again, is the price of division: Scotland's citizens will be able to reduce how they and those who live among them can be understood, they can cut themselves off from the peoples they have mixed so well with. Among all this, and the much more that has been written and shouted, how does a Christian vote? I don't think there's an argument that can be made one way or the other that is decisive for a Christian. I’ve heard someone suggest that the unity/diversity/equality of the Trinity is echoed by the union. A less persuasive case is that the scattering of the nations at Babel (Genesis 11:9) is best obeyed by the United Kingdom fracturing. Some Christians up here are suggesting that they could have more influence on Holyrood than Christians presently do at Westminster but I’m not convinced that this is would be the case, especially with the currently-unique growth of church size and influence in London. So that’s what I hope for: whatever brings about this peace that benefits the advance of the gospel. I cannot know which option will, so I pray and vote with faith that God will work whatever happens to His advantage.